Ten combinable onboard rhythms • Convolved Plate reverb for retro authenticity • Velocity Retrofit for humanising your beats • Multiple randomised round-robin samples to preserve a true analogue feel • Fully analogue sounds, all the way from Italy! 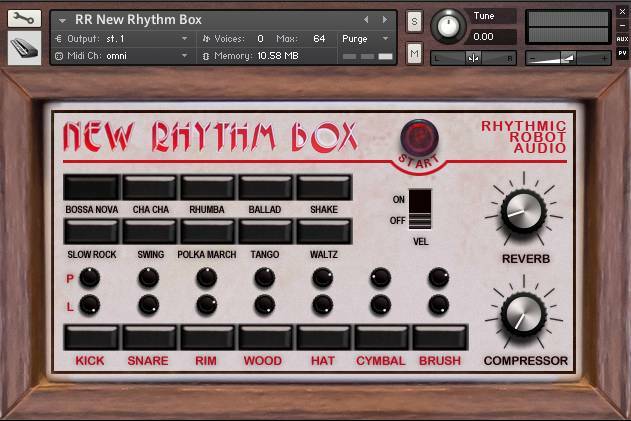 The New Rhythm Box brings a pleasantly mellow, chilled tonality to its sounds – probably as a result of how its innards have aged. The Kick drum is noticeably punchier than WurliBeat but still much softer and rounder than some of our boxes from the 80s, which puts it in a useful middle ground where it can make its presence felt through a denser mix but without feeling modern. (Adding some compression really gives it some weight.) We captured the Snare kit piece both with and without an attendant hi-hat, because it sounds really great with it spliced in there (and is played that way in most of the onboard rhythms); and the Rim and Wood block sounds add nicely to the variety on offer, offering up some neat little percussion possibilities. The Cymbals and Hats are – typically for this kind of machine – basically white noise bursts; though in fact there’s so much compromise in the high-frequency extension of the box that they’re more like pink-noise bursts. We had some really good results alternating these with hats from other beat boxes here in the studio, getting a kind of “flavours of analogue noise” vibe going. The New Rhythm Box hales from sunny Italy, and has broadly the same warmth and easygoing tone as the rhythms built into Skyline: perhaps they used to put something in the transistors over there? It’s perfectly suited to chillout, electronica, softer pop styles and anything where a laid-back analogue tone is needed. You can also layer it with other more aggressive sounds to give them a kind of veneer of antiquity. Our Velocity Retrofit tweak allows for humanised beats impossible to generate on the original, while of course with the preset rhythms can be combined either with each other or with your own patterns for a dab of authentic old-style atmosphere or a full-on culture clash of ancient vs modern. All the kit pieces have been sampled repeatedly and the samples are chosen randomly on playback, preserving that all-important analogue variability. With the New Rhythm Box, old is the new new! Love this one for the quirky vibe! Can we get a “clean” sample of the background hum alone? Very beefy samples of the preset patterns and individual voices (the latter have controls for pan and level). Add in compression and reverb – and choose to switch velocity on and off – and you’re good to go. A worthy addition to the vintage drum machines folder. It’s hard to beat the small, lofi tones on this little beasty. Love to use the papery snare and hi hat on this. I also really like the reverb and wish I could use it as a stand alone reverb effect! Another hit instrument from Rhythmic Robot …! !